...well THAT didn't go according to plan. Got up my usual time and had my usual pre-5K nutrition - 2 cups of the black stuff and a piece of fruit, in this case an apple. I like to keep the stomach pretty empty for the short churn and burns. Started sipping on my Lemons and Limes Skratch - would have LOVED to take their new hot Apple and Cinnamon out for a spin in light of the single-digit weather, but NOTHING new on race day. Ever. Sad. It was about 11 degrees at the start. Luckily the forecasted wind wasn't there. 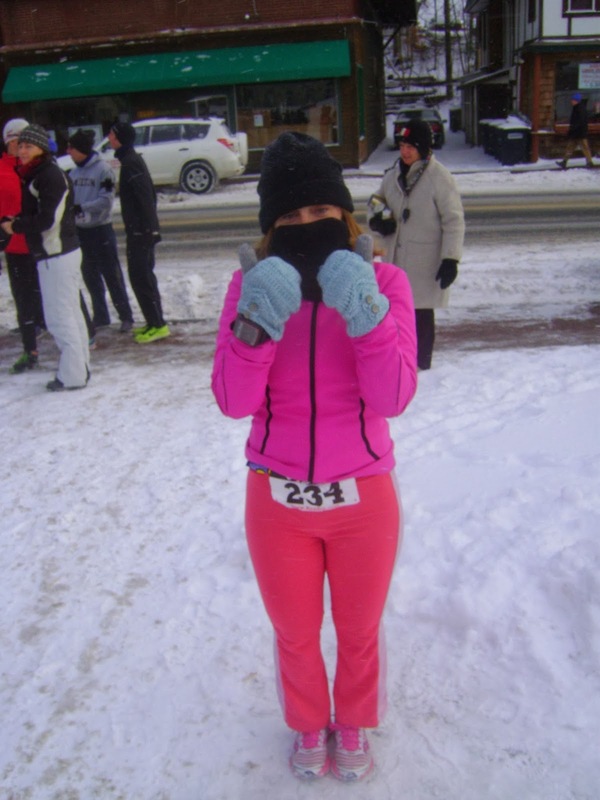 I tried to warm up beforehand but it was tough in those temps - literally hard to stay warm enough to stay loose. Trying to warm up. BRRR. Ready to go. At least I'm trying to convince myself I am. They started us in the middle of the road, which hadn't been salted, so I spent the first 100 meters slipping around tryig to go straight up. I crossed the street several times (having to hop a snowbank each time) trying to find a good sidewalk - definitely lost a lot of time and energy the first .15 miles or so. Trying to get up to speed after the brutal start. 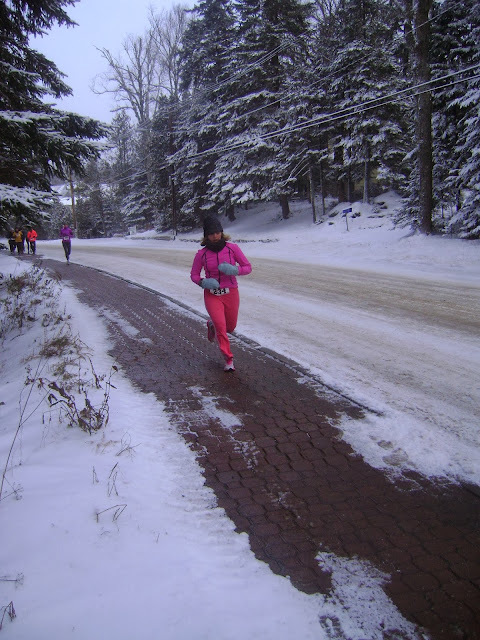 Finally got into a groove for a half mile, then we had another climb that's usually nothing, but it was completely iced over. After the first mile the sidewalk cleared and flattened back out, but I think I used up a LOT of energy that first mile. I kept looking at the pace on my Garmin and thinking "NOT GOOD ENOUGH!" Right before the last climb. In the background is the IMLP start. Fancy a swim? Had ANOTHER short climb that ALWAYS hurts because it's at mile 2.5, and THAT was snowed out too and required jumping a snowbank to cross the road. At least the course ENDS with a nice steep downhill. How I felt about my finish. Slowest 5K in a while, but it was the conditions, not my fitness. 13 out of 117 women (no age groups). 34 out of 198 overall. Wow, love Lake Placid so much :) Can't believe you guys got it so wintry there already! I would be very interested to read more about your TG dinner! I'm thinking of getting into the Whole30 after the holiday season, and your dinner looks so lovely! LOL...actually it usually comes EARLIER. We had an unusually mild autumn. We had a really nice grilled steak, boiled asparugus with ghee, french cut green beans, a dish with assorted olives and roasted nuts, roasted sweet potatoes with ghee, pomegranate seeds, and a salad with EVOO and vinaigrette.